We are now well into the new year and the first flurries of snow have finally arrived and so far already it’s been snowing on and off since Thursday’s 1st delivery of thick snow. Perfect whether for staying indoors with a nice cup of hot green tea and writing a blog! January so far has been very busy for Looney and with valentines around the corner I’ve been balancing customer orders, bespoke request & orders as well as preparing for Valentines 2013! So far I’ve managed to re-design Reece and Bella and I am currently working on two new designs. These will hopefully be finalised and ready to be released onto the site before next weekend. This was unfortunately delayed due to how busy Looney’s been in January (not that I’m complaining!). I’ve been working hard on bespoke orders too this month; I recently finished a 100th Birthday card with a Scottish theme and I really did enjoy spending the time creating this one. 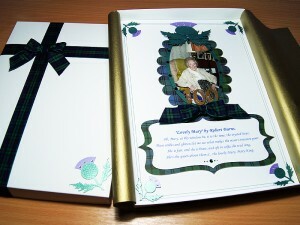 And I’ve currently started work on two other cards one for a 70th Birthday (so excited by this one – lots of sparkle!) and a Sapphire Wedding Anniversary for a repeat bespoke customer. My Husband and I have also been very recently working on updates to the website, which I do hope will improve usability. We’ve worked on improving the personalisation options to make this clearer for customer when personalising their cards and have now added which side the insert message will be displayed on to the product information page (in most cases traditionally the right-hand side). As all luxury handmade now come with a printed paper insert, we have now also added the option of including an insert message to both the left-hand side and the right-hand side to the product pages. Now onto designing again and pizza! 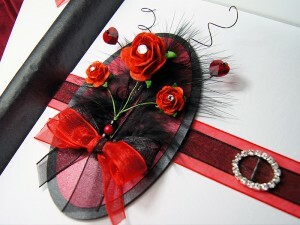 This entry was posted in Looney News and tagged valentines, valentines day, news, bespoke on January 20, 2013 by Sherrie.